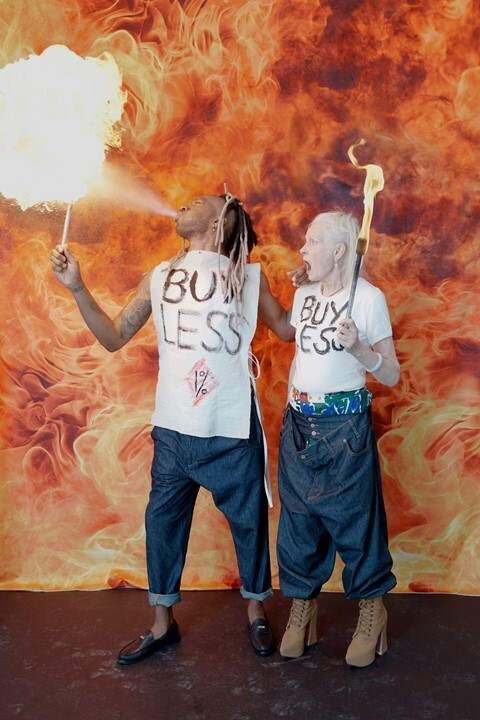 In keeping with her defiantly punk ethos, Vivienne Westwood has always done things her own way. It’s no surprise then, that for a second season running, she decided to digitally-drop her new collection. “Part of my philosophy is – if we had culture instead of consumption we would not be in this environmental mess because we would have a different ethos,” Westwood explains of her starting point for SS19. Drawing inspiration from Taoism – in particular its five elements, which include fire, earth, metal, water, and wood – and the Chinese symbols of peony and dragon, which represent the lifeforce of the cosmos, Westwood’s newest collection is a playful spectacle of checked and pinstriped relaxed tailoring, printed looks, knitwear, slogan tees and, of course, shirts. The collection’s accompanying lookbook and short film – shot by Hedvig Jenning and styled by Sabina Schreder – showcases the line and advocates for societal and environmental issues through the designer’s voice narration. Westwood’s punk fight is joined by a diverse cast of models (including Jenkin Van Zyl and Anthon Raimund among others) cast by the way they styled their own looks, embodying the brand’s longstanding DIY spirit. Head to Vivienne Westwood website, and stay tuned for the collection release.